lechu bot not public yet ? Iam Afraid To Post It here. You People Says It Is Virus.With The Scan Result from virus Total lol . 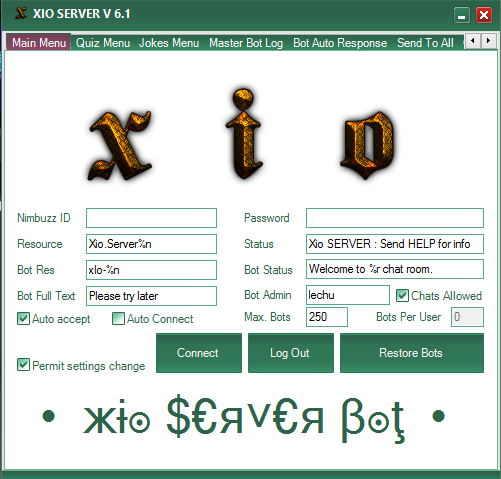 Add xio.server[You must be registered and logged in to see this link. ].com to put bot in your room..
c. show@pa to review the list. Bot will give admin to these ids when they are inside the room. when they leave the room bot will make them member. They will be admin again when re entering the room. If your room faces memberflood. a. mflood@on - Bot will lock the room when a member flood is detected And informs the room about member flood. Room will be reopened after a few minutes, if no one manually reopened the room. If your room faces rapid flood with ipchanger. a. amo@on - Bot will make room memonly when flood detected for a few minutes. send vchat@on from your add pvt to chat in your chatroom without entering ur id in room. Can u give this bot software? which command need to stop flood from verified flood antiflood@on/off ?? same in nature right ? alright any command which enables all type of flood stop commands? Now you can block any users from using super kick command.